Breast cancer is the most common cancer and the most frequent cause of cancer death among women worldwide. Breast cancer is a complex, heterogeneous disease classified into hormone-receptor-positive, human epidermal growth factor receptor-2 overexpressing (HER2+) and triple-negative breast cancer (TNBC) based on histological features. Endocrine therapy, the mainstay of treatment for hormone-responsive breast cancer involves use of selective estrogen receptor modulators (SERMs), selective estrogen receptor downregulators (SERDs) and aromatase inhibitors (AIs). Agents that target estrogen receptor (ER) and HER2 such as tamoxifen and trastuzumab have been the most extensively used therapeutics for breast cancer. Crosstalk between ER and other signalling networks as well as epigenetic mechanisms have been envisaged to contribute to endocrine therapy resistance. TNBC, a complex, heterogeneous, aggressive form of breast cancer in which the cells do not express ER, progesterone receptor or HER2 is refractory to therapy. Several molecular targets are being explored to target TNBC including androgen receptor, epidermal growth factor receptor (EGFR), poly(ADP-ribose) polymerase (PARP), and vascular endothelial growth factor (VEGF). Receptors, protein tyrosine kinases, phosphatases, proteases, PI3K/Akt signalling pathway, microRNAs (miRs) and long noncoding RNAs (lncRNAs) are potential therapeutic targets. miR-based therapeutic approaches include inhibition of oncomiRs by antisense oligonucleotides, restoration of tumour suppressors using miR mimics, and chemical modification of miRs. The lnRNAs HOTAIR, SPRY4-IT1, GAS5, and PANDAR, new players in tumour development and prognosis may have theranostic applications in breast cancer. Several novel classes of mechanism-based drugs have been designed and synthesised for treatment of breast cancer. Integration of nucleic acid sequencing studies with mass spectrometry-based peptide sequencing and posttranslational modifications as well as rational drug design will provide a more comprehensive understanding of the pathophysiology of breast cancer and help in evolving therapeutic strategies. 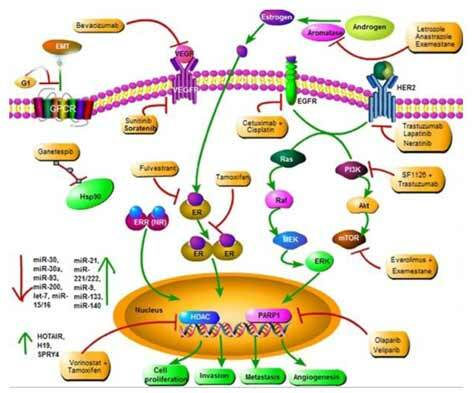 Keywords: Breast cancer, endocrine therapy, estrogen receptor, human epidermal growth factor receptor-2, lncRNA, microRNA, triplenegative breast cancer, tamoxifen, trastuzumab. Keywords:Breast cancer, endocrine therapy, estrogen receptor, human epidermal growth factor receptor-2, lncRNA, microRNA, triplenegative breast cancer, tamoxifen, trastuzumab. Abstract:Breast cancer is the most common cancer and the most frequent cause of cancer death among women worldwide. Breast cancer is a complex, heterogeneous disease classified into hormone-receptor-positive, human epidermal growth factor receptor-2 overexpressing (HER2+) and triple-negative breast cancer (TNBC) based on histological features. Endocrine therapy, the mainstay of treatment for hormone-responsive breast cancer involves use of selective estrogen receptor modulators (SERMs), selective estrogen receptor downregulators (SERDs) and aromatase inhibitors (AIs). Agents that target estrogen receptor (ER) and HER2 such as tamoxifen and trastuzumab have been the most extensively used therapeutics for breast cancer. Crosstalk between ER and other signalling networks as well as epigenetic mechanisms have been envisaged to contribute to endocrine therapy resistance. TNBC, a complex, heterogeneous, aggressive form of breast cancer in which the cells do not express ER, progesterone receptor or HER2 is refractory to therapy. Several molecular targets are being explored to target TNBC including androgen receptor, epidermal growth factor receptor (EGFR), poly(ADP-ribose) polymerase (PARP), and vascular endothelial growth factor (VEGF). Receptors, protein tyrosine kinases, phosphatases, proteases, PI3K/Akt signalling pathway, microRNAs (miRs) and long noncoding RNAs (lncRNAs) are potential therapeutic targets. miR-based therapeutic approaches include inhibition of oncomiRs by antisense oligonucleotides, restoration of tumour suppressors using miR mimics, and chemical modification of miRs. The lnRNAs HOTAIR, SPRY4-IT1, GAS5, and PANDAR, new players in tumour development and prognosis may have theranostic applications in breast cancer. Several novel classes of mechanism-based drugs have been designed and synthesised for treatment of breast cancer. Integration of nucleic acid sequencing studies with mass spectrometry-based peptide sequencing and posttranslational modifications as well as rational drug design will provide a more comprehensive understanding of the pathophysiology of breast cancer and help in evolving therapeutic strategies.